When I was a senior in high school – many full moons ago – I volunteered at a haunted house to help raise money for families in need. Very quickly I learned that scaring people was like crack on dry ice. I loved, loved, loved scaring the hell out of people. My costume was simple; a black robe, black hood, platform shoes to make me look seven feet tall, hideous face makeup, and big heavy chains around my shoulders. I hid behind an unmarked, pitch-black dead-end that was invisible due to a blinding light. Before they entered my scare zone, they had already experienced several “did-I-just-poop-in-my-pants” moments. As they approached me, I slowly walked out from behind the blinding light, looking down at them, howling and rattling my chains. That’s all it took. It was freak-out time. Some people came close to passing out. Let’s just say there were many times, we had to request the clean-up crew. And they paid to experience this nightmare. Too many times, going to work is like entering a haunted house. The place is filled with hideous traps and grotesque practices that torment unsuspecting employees. 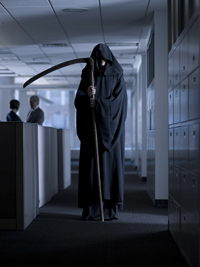 In these workplaces, it’s like Halloween happens every day. Still dreaming of finding a place where they understand this and treat people accordingly. Thanks for sharing this…it’s good.